Breeze.pm shows you what's being worked on, who's working on what, where things are in the workflow and how much time it took. With this integration, you'll be able to mark completed tasks from Breeze and automatically entered into I Done This as Dones. Just mark a task as done and we'll do the rest. 1. Simply log into your I Done This account and click on the Account Settings on the bottom left of the screen. It will be located under the Notifications tab. 2. Scroll to the category API Token. Copy the API token and head to your Breeze.pm account. 3. After logging in, click on the top right corner where your account name sits. 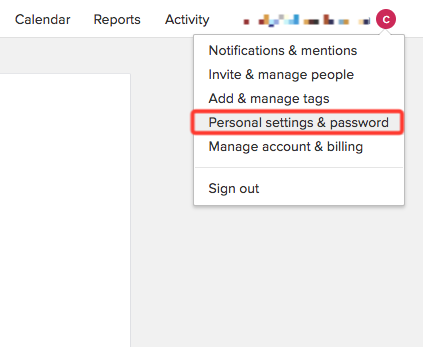 From the dropdown menu, select "Personal Settings & Password". 4. Scroll down to the section where you authenticate the I Done This integration. Paste your API token there and select connect. Once you select connect, you will be able to select the team your completed tasks enter as dones.